Hey Hey! This is Kaye Champ, owner and illustrator of Pretty Girl Digitals. Today friends I’m going to quickly show you how to use chat stickers as an emoji message using the Lula Gif Emoji Sticker app, available now in the Apple App Store for $1.99. The Lula Gif Emoji Sticker app has over 50 emoji and animated sticker styles of a fun girl totally giving life to our everyday thoughts and expressions. You can watch the quick tutorial or read the steps below to follow along. Why do you need chat stickers all up in your life? Chat Stickers are Stickers are illustrated pre-designed messages that punctuate conversation and illustrate thoughts. It is a fun and practical tool to support and affirm your crew easily and quickly. They are more personal than the default keyboard emojis. And way easier than the time involved to create a bitmoji. To start, Open text message, select new message in top right corner and choose a friend. 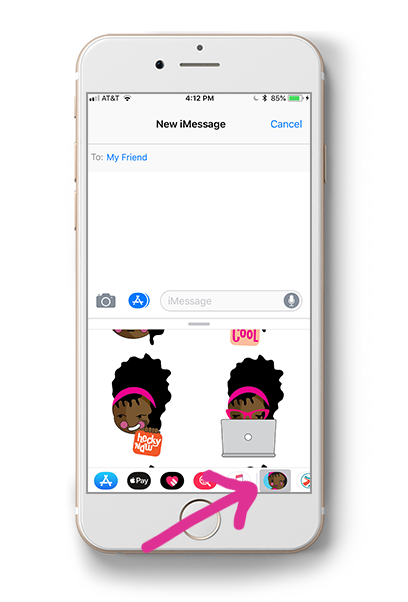 Select the App Store icon to the left of imessage window. The stickers available in that pack with appear in the browser window. Scroll and select a chat sticker. I chose the cool beans sticker. It now appears in the text message window. To send, press the blue arrow in the bottom right message window box. If you change your mind, press the x in the top right corner of the sticker within the message window. Choose another sticker. I chose giggles. If you want to add text you can do so right underneath the image. Press the bottom message box window and type what you want to say. Hit blue arrow and you just sent the cutest chat sticker to a friend. Enjoy and have fun! Go brighten a friends day with a quick message. It is easy to do with the Lula Gif Emoji Sticker Pack. Thank you friends.